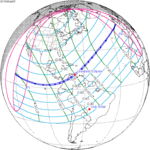 There will be a solar eclipse on July 16, 2186, which will be the longest total eclipse for thousands of years. 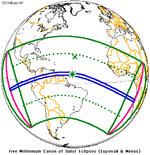 The eclipse will pass over the southern Galápagos Islands (with a total eclipse of 4 minutes occurring over the southern tip of Española Island), the northern tip of Ecuador (with a total eclipse of 3 minutes and 26 seconds on Isla Santa Rosa), central Colombia (4 minutes and 50 seconds over Bogota), central Venezuela, and northern Guyana (7 minutes and 4 seconds just north of Anna Regina). The Earth being very near aphelion (furthest away from the Sun in its elliptical orbit, making its angular diameter nearly as small as possible). This occurs around July 6th. The Moon being almost exactly at perigee (making its angular diameter as large as possible). The moment of greatest eclipse will be just 50 minutes after perigee. The midpoint of the eclipse being very close to the Earth's equator, where the Earth's rotational velocity is greatest. 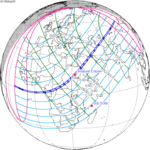 The midpoint of the eclipse being near the subsolar point (the part of the Earth closest to the Sun, and therefore also closest to the Moon during an eclipse). 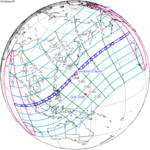 The vector of the eclipse path at the midpoint of the eclipse aligning with the vector of the Earth's rotation (i.e. not diagonal but due east). For solar eclipses at the ascending node (odd numbered saros) this occurs approximately 12 days after the summer solstice. The longest historical total eclipse lasted 7 minutes 28 seconds on June 15, 743BC. 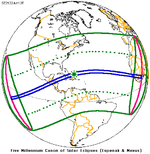 The longest eclipse theoretically possible for the 3rd millennium is 7 minutes and 32 seconds. 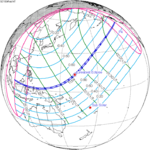 ^ Total Solar Eclipse of 2186 July 16 - Interactive Eclipse Path Using Google Maps NASA Eclipse Website, Fred Espenak. ^ "Lunar Perigee and Apogee Calculator". ^ Meeus, J. (December 2003). "The maximum possible duration of a total solar eclipse". Journal of the British Astronomical Association. 113 (6): 343–348. Bibcode:2003JBAA..113..343M. Retrieved 22 December 2013. ^ Mark Littman; Fred Espenak; Ken Wilcox (2008). "A Quest to Understand". Totality: Eclipses of the Sun (3rd ed.). New York: Oxford University Press Inc. ISBN 0-19-953209-5. "Eclipse expert Jean Meeus calculates the maximum possible eclipse duration of totality in a solar eclipse is currently 7 minutes 32 seconds.